Including myself, in autism-tips.com, I keep repeating: “knowledge is power”. It definitely is. But a new study has proved that training parents to handle serious disruptive behaviors of their child with autism is more effective than just educating them. The study offered training sessions and education sessions for 24 weeks and the result showed that both yielded positive outcome, but training scored much more efficient. 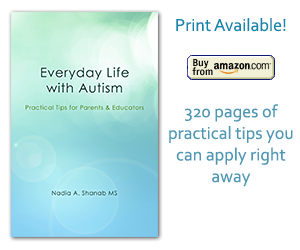 Continuous learning about the ASD condition and trying to stay informed is pivotal for parents. Knowledge will greatly help parents better understand how their child perceive the world. However, parents also need to learn how to face and handle some uncontrollable behaviors. For example, self-injurious behavior, temper tantrums, aggression, and non compliant behaviors are much better handled when parents receive proper training and learn strategies. Training and education go hand in hand for best results. Training, however, has a huge impact on parents’ ability to handle tough problems. Your homework parents is to find out where you can get such training in your city or town. Parents, you are the closest and most important people to your child. To be able to provide the best possible help to your child get a training to learn how to handle their serious disruptive behaviors. You’ll be using these strategies all the time to make your life easier and happier.